INSIGHTS what optimal expansion plans look like. We are doing this with one in Florida). What’s the criteria for that? 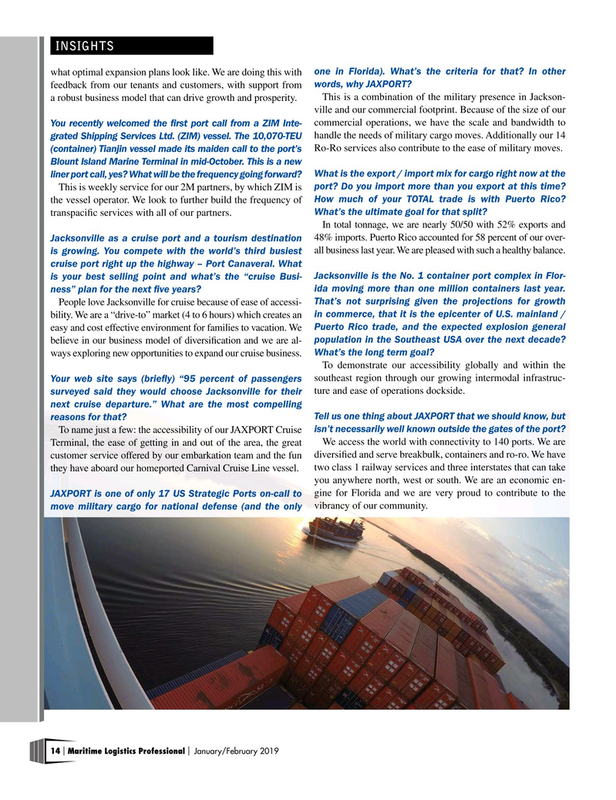 In other feedback from our tenants and customers, with support from words, why JAXPORT? You recently welcomed the frst port call from a ZIM Inte- commercial operations, we have the scale and bandwidth to grated Shipping Services Ltd. (ZIM) vessel. The 10,070-TEU handle the needs of military cargo moves. Additionally our 14 (container) Tianjin vessel made its maiden call to the port’s Ro-Ro services also contribute to the ease of military moves. This is weekly service for our 2M partners, by which ZIM is port? Do you import more than you export at this time? the vessel operator. We look to further build the frequency of How much of your TOTAL trade is with Puerto Rico? transpacifc services with all of our partners. What’s the ultimate goal for that split? Jacksonville as a cruise port and a tourism destination 48% imports. Puerto Rico accounted for 58 percent of our over- is growing. You compete with the world’s third busiest all business last year. We are pleased with such a healthy balance. cruise port right up the highway – Port Canaveral. What is your best selling point and what’s the “cruise Busi- Jacksonville is the No. 1 container port complex in Flor- ness” plan for the next fve years? ida moving more than one million containers last year. People love Jacksonville for cruise because of ease of accessi- That’s not surprising given the projections for growth bility. We are a “drive-to” market (4 to 6 hours) which creates an in commerce, that it is the epicenter of U.S. mainland / easy and cost effective environment for families to vacation. We Puerto Rico trade, and the expected explosion general believe in our business model of diversifcation and we are al- population in the Southeast USA over the next decade? ways exploring new opportunities to expand our cruise business. What’s the long term goal? Your web site says (briefy) “95 percent of passengers southeast region through our growing intermodal infrastruc- surveyed said they would choose Jacksonville for their ture and ease of operations dockside. To name just a few: the accessibility of our JAXPORT Cruise isn’t necessarily well known outside the gates of the port? JAXPORT is one of only 17 US Strategic Ports on-call to gine for Florida and we are very proud to contribute to the move military cargo for national defense (and the only vibrancy of our community.